The foreigners who visit India in Student visa, Research Visa, Employment Visa, Medical Visa, Medical Attendant Visa and Missionary Visa have to register with the concerned officer within 14 days from their arrival in India. Those foreigners who visit India in any other Visa need not register if they stay in India for less than 180 days. If they wish to stay for more than 180 days then they have to register before the expiry. Nationals from Pakistan should register within 24 hours of their arrival and the Afghanistan nationals should register within 7 days of their arrival. Registration is not done at the Airport and must be done at offices of FRRO’s or District Superintendent of Police. 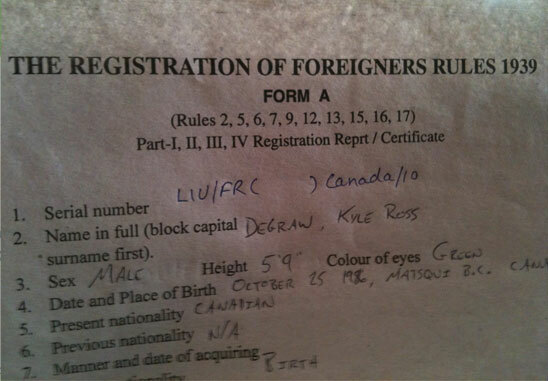 Children up to the age of 16 years need not register no matter what their visa type is. During registration, the applicant has to provide the necessary information and sign the Registration report in front of the officer. They will be then provided with the Registration Certificate copy. For those in Business visa have to produce papers showing the authenticity of the business. For those in Research Visa, bonafide certificate and letter from the nodal agency that sponsors it have to be produced. The foreigner who registered has to produce the certificate of registration for inspection to the registration officer or a police officer within 24 on demand. The finger impression/signatures should be done in the presence of the Registration Officer and each set attested by him. If there is a change of registered address or the person is absent from the registered address for a period of 8 weeks, then the foreigner has to report it to the Registration officer. If the foreigner is planning to return, then the returning date has to be informed or if he is moving away then the change of address have to be mentioned. If the foreigner stays at any place other than the district in which the registered address is located for duration of more than 8 weeks, then he has to inform the registration Officer of the district in which he is residing at present. It is necessary to inform about any changes to the Registration officer. If there is any change in the details recorded in the registration certificate, then in order to maintain the accuracy it has to be reported within a period of 14 days. A foreigner who wishes to return from India have to return back the Registration certificate to the registration officer of the place where the registration have been made or to the Immigration officer at the time of final departure. If the certificate has been submitted to the concerned officer other than the Immigration officer, then a receipt will be obtained which has to be shown to the Immigration officer during the departure. If the Registration certificate has been lost or destroyed then the foreigner can approach the registration officer furnishing the reason for the loss of the certificate along with the application for issue of a duplicate copy of the same.